Breast cancer is a type of cancer that is formed in the breast cells. It is the second most common type of cancer diagnosed in United States behind skin cancer. If you are suspected to have breast cancer, your doctor is going to decide the additional tests for determining whether the cancer has metastasized or not. Before any treatment is given, the breast stage will have to be ascertained. There are usually 4 stages of breast cancer, and stage 2 breast cancer will be discussed in detail in this article,. 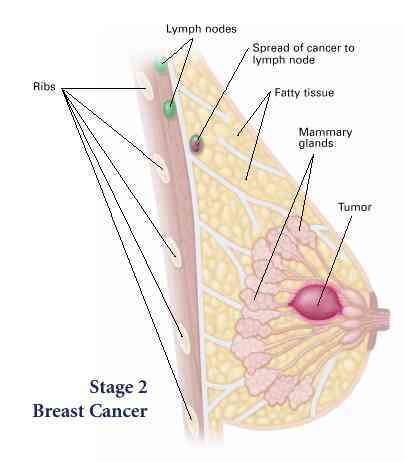 Stage 2A: T0, N1, M0:Breast tissue contains no tumor but cancer cells are present in lymph nodes closer to your breast. Stage 2A: T1, N1, M0:The tumor has attacked nearby tissues at a distance of 0.1 cm and has spread of one lymph node at the minimum. OR, the tumor is 2 cm or smaller in size and has spread to one lymph node at the minimum. Stage 2A: T2, N0, M0:The tumor is more than 2 cm but under 5 cm in size and isn't affecting any lymph nodes. Stage 2B: T2, N1, M0:The tumor is over 2 cm but smaller than 5 cm in size and is affecting lymph nodes close by. Stage 2B: T3, N0, M0:The tumor is bigger than 5 cm but isn't affecting any lymph nodes and hasn't reached your skin or chest wall yet. Patients of stage 2A breast cancer who undergo full treatment had an 81% 5-year survival rate according to the findings of the National Cancer Data Base. Survival rate for patients with stage 2B tumors was found to be 74%. These findings are based on the data collected over 10 years ago between 2001 and 2002. There have been many improvements in treatment methods during this time so newly diagnosed patients can expect to survive for a longer term. According to Cancer. org, the general 5-year survival rate of patient with stage 2 breast cancer is 93%. Follow-up care with an oncologist is essential for 5 years to ensure that you are recovering smoothly and that there isn't any need for recurrence treatment. When celebrating 5-years after surviving this cancer, you can start thinking that your cancer might never come back. You might have other health issues to deal with, but there are fewer chances to die because of your cancer. Thus, the prognosis is good if you have gone through all the treatments and follow-up visits after diagnosing the stage 2 breast cancer. There are a number of treatments available for stage 2 breast cancer. Your doctor is going to decide your treatment plan that is going to include the following methods. All you need to do is to follow the instruction completely for better prognosis. Surgery is the standard form of treatment for this type of cancer. A mastectomy, in which the entire breast has to be removed, is required for large tumors, while a lumpectomy, in which just the tumor and a little portion of the tissue present around it are removed, is done if you have a smaller tumor. The surgeon might have to remove a few lymph nodes in both cases. Breast reconstruction surgery can be opted for after a mastectomy. Radiation therapy can help in killing off the cancer cells that had survived after surgery. This treatment is mandatory after a lumpectomy but can also be performed after mastectomy, especially if the tumor that was removed after surgery was very large. Chemotherapy is another additional therapy that can help in destroying the cancer cells that had been missed during surgery. Chemotherapy can be performed before the surgery too for the purpose of shrinking the tumor. Chemo can be given in the form of pills, liquids and can even be infused directly into your veins. Hormone therapy is particularly helpful for those women who had a hormone receptor-positive cancer. This therapy involves prescribing drugs that stop the tumor from getting the hormones it needs to grow. Ovary removal or taking drugs that prevent ovaries from releasing hormones are some of the methods available for women who haven't reached menopause yet. Targeted therapy is a relatively new treatment method that is used in combination with chemotherapy. In this therapy, patients are given a drug that stops the protein HER2, which is present in around 20% breast cancer patients, from growing the cancer quickly. Active treatment for stage 2 breast cancer can go on for up to eighteen months or more. You might only need surgery and radiation for 6 weeks or have to go through a lot of radiation, chemo and other additional therapies. Nonetheless, you will have to go to your oncologist for follow-up checkups for up to 5 years, during which you might have to undergo hormone therapy depending on the hormone sensitivity of your tumor. The follow-up visits will become sparse overtime if you don't have a recurrence, then your frequent cancer checkups and estrogen-lowering medicines will also end. However, you must continue doing breast self-exams on a monthly basis and have regular breast screenings. Take as much time as you need to recover and think about the ways that can help you in living a healthy life.